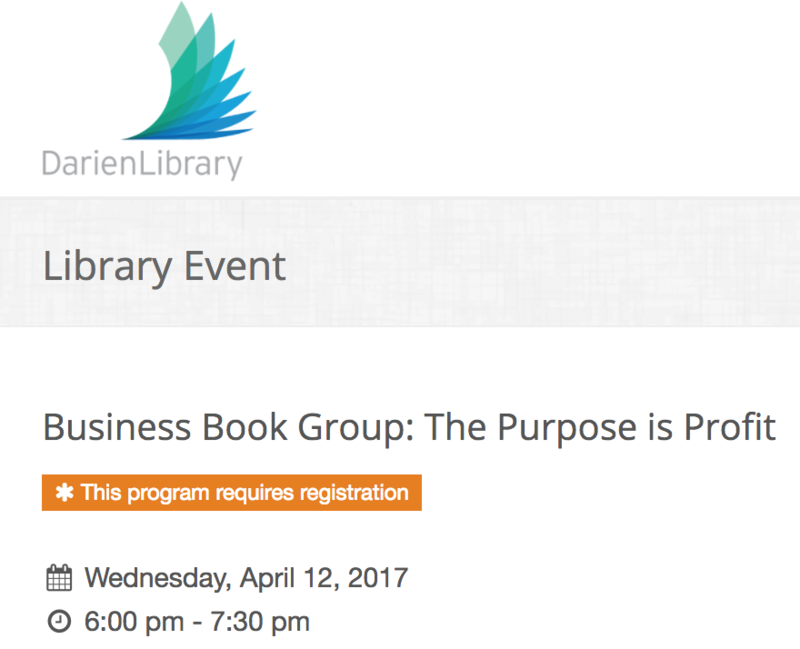 Darien Library’s Business Book Group will meet to discuss The Purpose is Profit: The Truth about Starting and Building Your Own Business on Wednesday, April 12th at 6:00 pm. The authors, Ed McLaughlin and Wyn Lydecker, will join the group to answer questions from the participants. Both McLaughlin and Lydecker live in Darien. Library staff members will lead the informal discussion from 6:00 – 6:45 p.m., followed by networking over wine, beer, and light refreshments until 7:30 pm. The Purpose Is Profit is a 2017 Silver Axiom Business Book Award Winner in Entrepreneurship. Copies of the book are available at the library. Prior reading of the book is not necessary to attend the discussion. The Business Book Group has been meeting since January 2014. Advance registration is required at: www.darienlibrary.org/event/955.